It behooves the patriotic man to examine his leaders, or prospective leaders, with a careful, jaundiced eye, in the immediate aftermath of an act of vile treachery like what the world witnessed on Nov. 13 in Paris. Do their hearts break with anguish, no less than their chests ache with hunger for justice? Or do they, quailing, reach for barest platitude, leave unsaid what most needs saying, and lash out at others who possess clearer words and better courage? Again by their fruits you shall know them. Sympathy for the French is not enough. #PrayforParis is not enough. Our statement of solidarity must be unmeeching. Hearts break and chests ache for justice. If not both, you are not worthy of leadership. 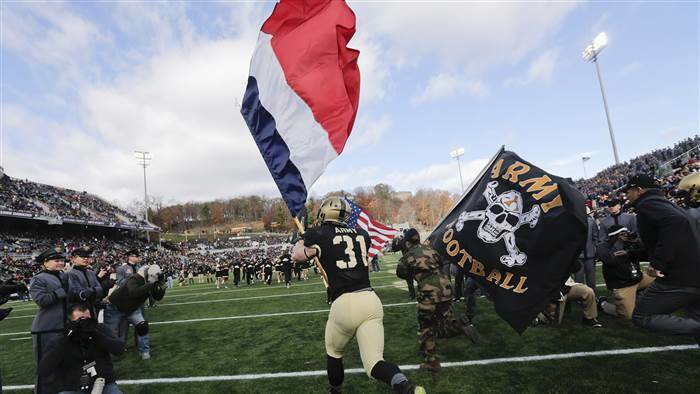 Over the last two weekends, all over the US (notably at the Army-Tulane and the LSU-Arkansas games), football players have defiantly carried both American and French flags to the center of the field before kickoff. A simple gesture, but a profound one. Do you not think that many Frenchmen who hear of these tributes, this American solidarity, might find themselves, at least for a moment, warmed in their hearts and welling up with gratitude; as, for instance, we Americans felt likewise when the British Crown ordered that “The Star-Spangled Banner” be played at Buckingham Palace on September 12th, 2001? Every last Frenchmen (every last Englishman), just like every last American, who believes in government, believes that its first task is to secure us from foreign aggression. The French may be a proud and difficult people, but in this there is an undeniable unity. Brotherhood and fraternitè. The first task of the Republic is to preserve us from harm. Concretely: Should M. Hollande, in addition to current airstrikes, abjuring delay and Obama’s dithering, determine to dispatch French tanks, mobile artillery, close air support (have we sold them some A-10 Thunderbolts? — if not, we should), naval assets, ballistic missiles with super-payloads, and soldiers carrying rifles into hostile territory — into the territory of Islamic State — this American will raise the Tricolor and salute the French Parti-socialistè. Let the French socialist do what the American socialist has not the guts to do. But let all men observe the character of their leaders under this particular stress of treacherous war being made against our peoples. Nor will we ever forget that our allegedly Francophile Secretary of State, appearing at the US Embassy in Paris, did not forbear to urge the craven distinction between the Charlie Hebdo massacre and the recent Paris massacre. The former, he implied, was approaching justifiable; the latter not at all. The Secretary’s moral obtuseness insults our French allies and dishonors our own allegiance to them. The difference between the massacres is exclusively and definitively one of scale, not quality. Both were unpardonable assaults on the innocent, conceived out of the native doctrines of the Islamic religion to sow terror among those judged insufficiently submissive to that religion. Submission is the only sort of peace that Islam credits. Meanwhile, the President has spent the better part of a week on foreign soil calling his countrymen unAmerican because they’re skeptical of his policy to resettle Middle Eastern migrants in the United States. The House of Representatives passed a moderate bill which simply and sensibly requires more careful scrutiny of the migrants. This produced a clamor of denunciation, primarily from Democrats, even though a considerable number of them voted for the bill. Now in an extraordinary irony, the Democratic National Committee is running TV ads in America which, by way of underscoring these denunciations, extol the wisdom of none other than George W. Bush. So the Democrats have, from the mouth of the despised former leader of a party they fervidly oppose, taken some of his most ill-advised statements and commended them to us as wisdom. Were the situation not so somber, this spectacle would merit the sustained guffaws of belly-laughter. Initially, President Bush did have the extenuating factor of real ignorance. Who in America, realistically, in 2001, had a working knowledge of Islamic doctrine, tradition and history, sufficient to inoculate himself against the lies and platitudes that would ensue? Precious few. Who, realistically, was prepared to imagine, and promulgate as probable, that the resurgence of the Jihad would comprise one of the more emphatic strains of early 21st century history? But alas — Bush culpably persisted in this folly to the very end of his term in office, and a sizable portion of his own party is still committed to it. What happened after September 11th was that most people forcibly categorized the shock and horror according to the historical paradigms they had long operated by: on the Left, anti-Americanism; on the Right, anti-Communism. It has taken the greater part of a generation for the hard realization to set in, that a new (or rather very old, but newly revivified) and different paradigm applies. That the Democratic Party would very much like to roll back this realization, and re-establish complete ignorance of the nature of the Jihad and its Islamic roots as the regnant condition of the American people, is another observation that no one should forget. Yes, friends, in times like these patriots are obliged to watch those who would lead them with special care, and remember. Who in America, realistically, in 2001, had a working knowledge of Islamic doctrine, tradition and history, sufficient to inoculate himself against the lies and platitudes that would ensue? Precious few. I certainly didn't. I needed to read up. I am pretty sure someone like Bush did too. Sadly, that the Republican party, as a party, isn't all that much better, is a sad observation on the shameful state of the Republic. It is, effectively, a testament to moral degradation, for it is degraded WILLS that lead men to hide from such obvious truths. Meanwhile, the President has spent the better part of a week on foreign soil calling his countrymen unAmerican because they’re skeptical of his policy to resettle Middle Eastern migrants in the United States. Shocking how the Dem anti-American default paradigm (so common during the Bush years) can now be shouted from the White House itself, without shame, and without a universal backlash that humiliates the president. A Republic that doesn't even love itself has problems. >>Hearts break and chests ache for justice. If not both, you are not worthy of leadership. Tony notes that he certainly didn't. Neither did I. Did you? As for me in 2001, I could not have told you the difference between a Sunni, a Shia and a Sikh. I did not know that some Arabs are Christian. I was only vaguely aware that Pakistanis are not Arabs. I had never heard of Charles Martel, but had heard that rugs and pistachios come from Iran. I had seen the movie Ben Hur, in which a man in a flowing robe lets Charlton Heston drive his team of white chariot horses against Masala; and had seen The Man Who Would Be King, in which Sean Connery, son of Alexander, takes charge of a Muslim monastery or something. I had read Homer but did not so much as know of the existence of the Hadiths. So, in 2001, if the president informs me that Islam is a religion of peace, why, I tended to credit the notion. How distant 2001 now seems. "What happened after September 11th was that most people forcibly categorized the shock and horror according to the historical paradigms they had long operated by:...on the Right, anti-Communism." I can say now I know better -- I wonder how many of those folks would say the same? Exhibits A and B: Libya and Syria respectively. Not at all. It required several courses of study. One was in the immediate aftermath of September 11th, and included a heavy dose of Bernard Lewis. Another was the antidote to that over-optimistic fare, including two French scholars, Paul Fregosi and Charles Emmanuel Dufourcq. Medieval history is not something Americans do well, but the fact is that Islam was a huge factor for virtually the entirety of what we call Middle Ages; so any good history of that and related topics is bound to provide insight. On the contrary, the Democratic frontrunner views the situation identically to the Republicans runners, saving Trump and Paul. In September I laid out a comprehensive plan to counter Iranian influence across the region and its support for terrorist proxies such as Hezbollah and Hamas. We cannot view Iran and ISIS as separate challenges. Regional politics are too interwoven. Raising the confidence of our Arab partners and raising the costs to Iran for bad behavior will contribute to a more effective fight against ISIS. And as we work out a broader regional approach, we should of course be closely consulting with Israel, our strongest ally in the Middle East. Those calling out for war should spell out the war they want. War against IS--allied with pro-Assad party or against Assad as well? Are they willing to risk confrontation with Russia? Send tanks? yes but where and against whom? From a counter-Jihad perspective, it seems very odd that the three states (leaving Afghanistan) targeted by the Western allies were all secular. What has removing Saddam and Qaddafi done to counter Islamic terror? Quite the reverse. Paul Cella would prefer that we forget this inconvenient history--No American knew or could be expected to know anything about the Islam previous to 2001. Despite American decades-long involvement in ME, despite billions spent in arming Afghan jihadists- mislabeled as anti-communist freedom-fighters by a Republican administration. Can it be a Just War if prosecuted through ignorance? Can it be a Just War is prosecuted through strategic confusion and incompetence? Why is that peculiar targets for Western alliance has been secular govts unloved by KSA and Qatar? Do the strategic aims of KSA and Qatar coincide so perfectly with the USA and UK? From this perspective, the counter-Jihad looks a lot like jihad paid for by KSA. Don't forget, from a generation earlier, toppling the beloved Shah. And then there is the whole Syria thing itself, before the Assads. Do we classify the kingdoms of Morocco and Jordan "secular" or "religious"? They aren't caliphates. But they aren't religiously neutral. For some reason, we haven't gotten around to killing off the secular government of Turkey. Maybe it's only a matter of time. No need, Erdogan's party is doing a fine job of that. The moment they started preemptively arresting generals to break the Turkish military we should have contemplated arranging for a series of unfortunate events to be experienced by Turkish civilian leadership. For what it's worth, I was appalled at Bush II's "religion of peace" nonsense after 9/11. I was immediately appalled. Appalled at the time. It was such a stupid thing to say, especially in the immediate wake of an Islamic terrorist attack. I'm not saying I was prepared to write a scholarly monograph on the history of Islam, but we already had enough experience with Islamic terrorism prior to that in our own country and foreign policy, for decades, to know better. (Er, remember that Al Qaeda tried to take down the WTC once before?) By the way, when the plane hit the WTC, people were _immediately_ saying that it was Osama bin Laden's work. I mean, within seconds. Such an attack was almost expected, and from that very source. Plus I did know a bit of world history over the last umpteen centuries. Not to sound dismissive, but it really didn't take all _that_ much esoteric knowledge to realize that Islam is not a religion of peace. A CNN reporter has said almost exactly what Kerry said about the alleged difference between this Paris attack and the Charlie Hebdo and Jewish baker attack. What is interesting is the utter lack of guilt concerning this "blame the victim" mentality. I realize it is all too human to say, "Whew! At least that terrorist attack was deliberately targeting X group of people, and thank goodness I'm not part of X group of people, so I don't have to worry too much about it." But that all-too-human response should bother people somewhat. After all, going to buy bread at a Kosher deli is hardly a blameworthy activity! I'm not trying to restart the Charlie Hebdo debate, but the point is here that both Kerry and this reporter are articulating the idea that it's sorta all right for people not to get all that het up about terrorism so long as it is targeted at someone they (and a majority of Parisians) can view as "the other guy." Suppose, for example, that there were some Hindu terrorist group that went into a Muslim neighborhood and took hostages and murdered people at a Muslim-owned grocery store in the middle of Dearborn. Sure, in terms of actual danger or risk, I would conclude that I and my family are not at *very* great risk from that Hindu terrorist outfit. But now suppose that the Hindu terrorist outfit expanded its activities and started shooting a bunch of people in Chicago. I can't imagine standing up in front of a camera and explicitly drawing a distinction between the attacks and saying, in essence, "Well, it wasn't so bad when they just shot up that Muslim deli in Dearborn, but now look at them! They're shooting up people of all faiths in the middle of Chicago. Now that's _really_ bad." That would be obviously idiotic, callous, morally blinkered, and everything else. But evidently Kerry and this reporter don't even have that minimal amount of self-awareness to hear how their statements sound. I had read Homer but did not so much as know of the existence of the Hadiths. So, in 2001, if the president informs me that Islam is a religion of peace, why, I tended to credit the notion. Not to sound dismissive, but it really didn't take all _that_ much esoteric knowledge to realize that Islam is not a religion of peace. This is right. An American born about 1967 (as I was) learned in school a peculiar world history which skips somehow from Pericles and Caesar a thousand years ahead to greet Luther and William of Orange—Errol Flynn's Robin Hood enlivening Ye Merry Olde England at some indefinite era between. The theme of this style of history contrasts Enlightenment versus the Christian, preceded by Protestant versus the Catholic, underlain by Roman versus the Greek. When bored, when wishing to study an exotic topic for a change, one journeyed eastward with Marco Polo (pausing to rest only the briefest instant at Samarkand) and with William Adams to China and Japan. Christian missionaries were seen to travel everywhere abroad, oppressing the indigenes, an activity cast to foreshadow the American plantationist, oppressing the black. The theme of Saracen versus the Catholic apparently just did not fit the dominant morality play of the time. The theme of Saracen versus the Catholic seemed too minor, too discordant a riff. Of course, there were the Byzantines, but who know anything about them, except that they seemed to own a lot of restaurants in Chicago? And anyway, if you had read your Bible, you knew who Pharaoh and Ishmael were; and if you had seen Raiders of the Lost Ark, you witnessed John-Rhys Davies' genial portrayal of Islamic man with fez. What more was there to learn? Camels? Regrettably, I read Gibbon, and even Belloc, only after 9-11. If you were an American more or less of my generation, if during high school you once learned of Scipio but never of Sobieski, then you may know what I mean. After sleeping on the matter, I find one more thing to write. I wonder if your answer and mine do not in some sense share the same, serious flaw; namely, that you are an intellectual, and that, though perhaps I (who for instance read neither Latin nor Greek) am not, I travel at least in intellectualism's borderland, as it were. When I wrote, "Regrettably, I read Gibbon ... only after 9-11," I was boasting, because, you know, who reads Gibbon at all, whether before or after? This is not to imply that you have boasted. I have never known you to boast, but my point this morning is that the United States is no philosopher's kingdom. Americans used to dream of cowboys and Indians. Americans never dreamt of cowboys and jihadians. The Marines at Tripoli aside, Islam never fit our story. That the United States is no philosopher's kingdom is hardly news, yet to expect a Marcus Aurelius (and by dropping his name does one not again boast?) to make U.S. policy is to expect a thing probably not in the nature of the U.S. Here for better or worse the people rule, not the Antonines or even W4. So, yes, when you write, "[I]t really didn't take all _that_ much esoteric knowledge to realize that Islam is not a religion of peace," well, maybe, despite all that had happened, it did take that much. Still, it is pleasant to write comments to the attention of a clique of readers who may know who Marcus Aurelius and the Antonines are. And after all, our republic does have a genuine, democratic intellectual tradition, for example, [https://www.youtube.com/watch?v=nZyMc29QQK8]. Here's the thing, though, Howard: Bush said that in the *immediate aftermath* of an act of Islamic terrorism, which was itself the last in a series (what seems to us in 2015 a rather slow series, but a series nonetheless) of high-profile acts of Islamic terrorism, attempted terrorism, and wishes of death to America. So there was another, completely non-intellectual, source of knowledge of Islam--mere observation of the immediate world around one over the years leading up to 9/11, and of course observation of 9/11 itself. That would seem to be the time to re-evaluate any tendency one might have to think Islam the religion of peace, would it not? And why should the President be thought any greater authority on the religious essence of Islam than any other non-intellectual layman? To my eye it was blatantly obvious that President Bush's statements were a combination of political correctness (which we were already very well-acquainted with in 2001), wishful thinking, and a desire to influence Muslims by the power of suggestion. His comments positively _smelled_ like that. Any amount of political savvy and some moderately alert listening to the news should have given that clue. Above all, the sheer nature of the act we had just witnessed, coming from an Islamic group that had been loudly out to commit such acts for a long time (as reported over a period of years), should have caused skepticism about such a statement and should have made anyone wonder what the heck Bush was playing at by making such a confident declaration at such a time. If that, then, motivated more reading or study, all the better. and a desire to influence Muslims by the power of suggestion. His comments positively _smelled_ like that. Well, yes, I remember that much. I assumed his statement was made as a political ploy, though probably with (more or less) decent motivations, along the lines of "I am trying to show our home-grown and otherwise nonviolent Muslims that when we decide to beat the tar out of terrorists and state supporters of terrorism, it isn't religious but something else." Whether the ploy helped or not, for a period, is academic. It also helped along the state of the discussion to remain politically correct, i.e. to keep on NOT TRYING to ascertain what Islam really is.